Focusing on the history of ideas, this book explores important questions concerning knowledge in relation to philosophy, science, ethics and Christian faith. Kirk contributes to the current debate about the intellectual basis and integrity of Western culture, exploring controversial issues concerning the notions of modernity and post-modernity. Repositioning the Christian faith as a valid dialogue partner with contemporary secular movements in philosophy and ethics, Kirk seeks to show that in 'post-Christian' Europe the Christian faith still possesses intellectual resources worthy to be reckoned with. This book's principal argument is that contemporary Western society faces a cultural crisis. It explores what appears to be an historical enigma, namely the question of why Western intellectual endeavours in philosophy and science seem to have abandoned the search for a source of knowledge able to draw together disparate pieces of information provided by different disciplines. Kirk draws conclusions, particularly in the area of ethical decision-making, from this apparent failure and invites readers to consider Christian theism afresh as a means for the renewal of culture and society. 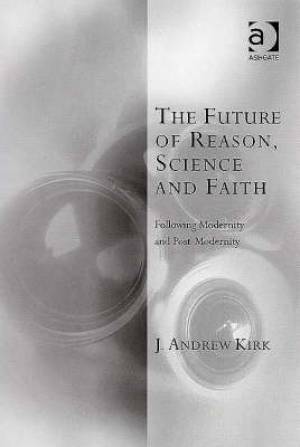 The Future of Reason, Science and Faith by J. Andrew Kirk was published by Ashgate Publishing Group in May 2007 and is our 66087th best seller. The ISBN for The Future of Reason, Science and Faith is 9780754658825. Be the first to review The Future of Reason, Science and Faith! Got a question? No problem! Just click here to ask us about The Future of Reason, Science and Faith.